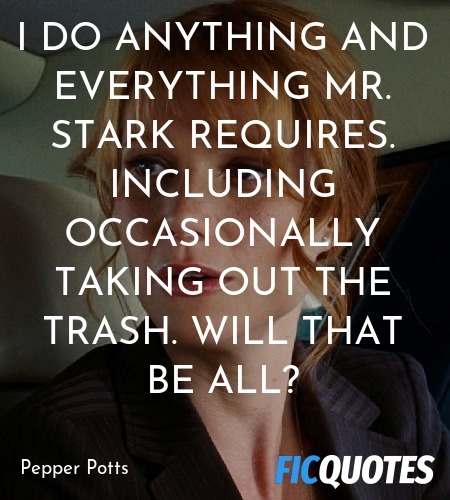 I do anything and everything Mr. Stark requires. Including occasionally taking out the trash. Will that be all? I know the math! Do it! Will that be all, Mr. Stark? We got a plan, and we're going to stick to it. FicQuotes brings you latest and greatest quotes from Movies, TV shows and Comics. You can browse quotes by title of the movie or tv serial or a particular character. We also have shareable images and videos of popular scenes. We are adding latest movie quotes to our collection daily.